A recent delivery from Amazon brought us an Amazon Echo. After some initial fun experimentation, including hooking it up to a Belkin Wemo switch and my Pandora account, we dove into the developer API to hook it up to the Vital AI platform and see what we could do. The Voice Interface configuration is a bit similar to the Wit.AI API, and setting things up on the Amazon side was easy enough. Some Amazon provided Java code gave us a good start on the webservice backend. We often use Vert.X ( http://vertx.io/ ) for web applications, and created the REST Webservice using that. This we configured to communicate with our Vital Prime server, which itself is configured with a database for storage. 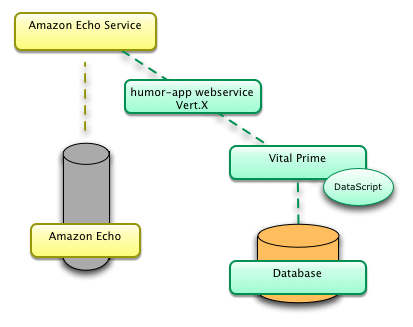 When the Echo gets a request like “Alexa, launch <your-app-name>”, the Echo communicates with the Amazon Echo service, which in turn communicates with the app, which in our case is implemented with the Vert.X Webservice. The Webservice makes an API call to the Prime server, which uses a datascript to fulfill the request. The datascript picks a random joke from those in its database, and replies to Echo with the joke. We loaded in a few hundred “Yo Mama” jokes as a starting point, and called the app “Funnybot” in an homage to a rather terrible episode of South Park. In this case the backend was a pretty simple database lookup, but a more realistic example would include a “serving” layer as well as a scalable streaming and “analytics” layer. Here we are using Apache Spark as the streaming (Spark Streaming) and the analytics layer (such as Spark GraphX or MLLib). Other than Spark, one could also use Apache Storm for streaming with the same basic architecture. 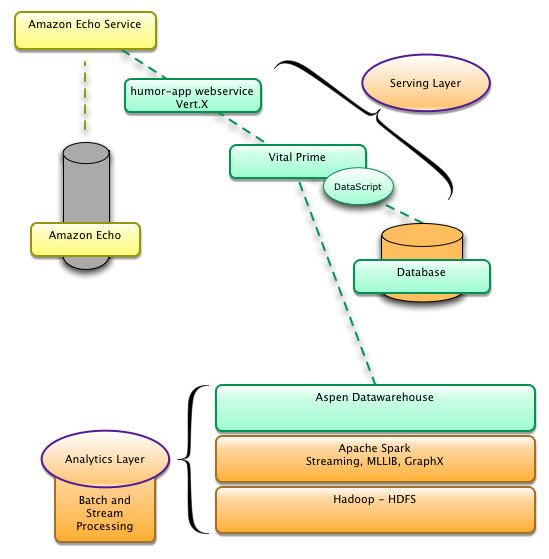 Aspen Datawarehouse is an open-source collection of software on top of Apache Spark to help connect streaming and analysis on Spark to the front end of the architecture, mainly by keeping the data model consistent and providing integration hooks — thus we get a nice handoff among Vert.X, Prime, and Spark. Datascripts are scripts running within Prime, typically implementing logic for an application that is close to the data. In this case, the datascript is doing a query for all the Jokes in the database, caching them, and randomly picking one from the cached list. We’ve created a simple domain model which includes a class for “Joke”, and by constraining the query to “Joke” objects, we get back all the jokes that are within the “humor-app” database. Please contact us at info@vital.ai if you would like assistance creating an Amazon Echo application. In my next post I’ll show a quick video of the result. We’re currently in the process of hooking the Echo to a Raspberry Pi via the Vital AI platform for a home automation application — stay tuned! Previous Article Northside Innovation and Luna! Next Article Amazon Echo tells “Yo Mama…” jokes.